JOB SEARCH GOT YOU DOWN? Hi, I’m Susan Dansby. I just heard that the average job search takes 19-22 weeks. And that blew my mind. That’s because, using the system in this book, I got the job of my dreams within 16 weeks AND I only averaged about an hour a day looking for that job. The book’s called How Did You Get That Job? My Dream Jobs and How They Came True. And I wrote it because people were always asking me how I got great jobs. I’ve been a TV Director, an Associate Producer, and a television writer – I wrote for As the World Turns for 13 years, and won four Emmys®. And most of that time, I worked from my own home in Atlanta. Is that a dream job or what? But this is about you. And your job search. And why it’s taking so blasted long. I’ll bet you’re going on interviews for jobs you’re not even slightly excited about. I’ve been there, my friend. I have SO been there. How to make your resume work for you; and a lot more. And, by the way, the two times I used this system, I got offered a job before I even asked for one! What’s better than that? You’ve got to buy this book. You think How Do You Get That Job will be dull, right? And long? And boring? Nope. This is a short, fun read. This book is a combination autobiography/job search manual – the story of my life told through short stories about the many jobs I’ve had. Some of it’s sad (being betrayed by my alcoholic father); some it’s funny (my one day as a product demonstrator). It’s also a road map of what to do – and what not to do – to get hired; and once you’ve got the job, how to keep it, and keep growing toward higher salaries and better job titles. It’s a success story. And, believe me, if I could rise to success in the extremely competitive entertainment industry, saddled with insecurities and a chip on my shoulder the size of Texas – you can succeed as well. And you can get where you want to go a lot faster, laughing at – I mean, learning from – my experiences. Who Should Buy How Did You Get That Job? People who’ve decided on their dream job and want to hit the ground running to launch that exciting, satisfying, new career. Need a career change? The system outlined here is one you can use in your spare time while you hold on to your job and your income (like I did). Since you’re not using more “visible” job hunt methods like posting your resume online, you have more control over when you’ll make your move. People who work in competitive fields like communications, information technology (IT), broadcasting, journalism, theater, music, film and television, writing, green jobs, etc. This book is a must-have for you. You’ll learn how to land good jobs in your chosen field (and get paid!) while you train, study and get experience toward that great job. People who are looking for management positions or executive jobs. This book is filled with coaching tips that will not only help you get a job, but help you keep one. The pdf format is absolutely the best way to get the most out of How Did You Get That Job? You can read the book on your computer or an electronic reader or iPad; then print out the pages you want to “work” through using the handy Workbook Forms bonus. Okay, let’s talk about the bonuses. connections you’ve made you didn’t even realize you had… (invaluable for job interviews) and much more. But don’t take my word for it. Here are some of the things people have said about How Did You Get That Job? 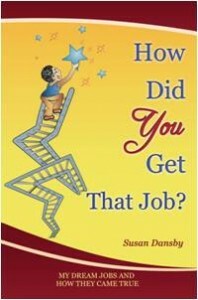 Susan Dansby’s “How Did You Get That Job?” is a must read for everyone! Whether you are just beginning to search for that lifelong dream job or if you are still wondering what you’d like to do when you “grow up”, this book is for you. Susan does an amazing job capturing your attention and leading you through the journey of working your dream. You will laugh and cry as you see yourself through her eyes! A must read for all! You can get How Did You Get That Job? My Dream Jobs and How They Came True plus $20 worth of bonuses for the low price of $17. That’s right, the book and bonuses for just $17. How Did You Get That Job? comes with a money-back guarantee. Try it for 90 days. If you aren’t completely satisfied, your money will be refunded – no questions asked. The best career advice I can give you is: Don’t wait to go for your dream! Think of the hours, days, weeks and years you’ll spend at work. Don’t you want that time to be filled with joy, achievement and financial reward? You can have that – starting today!